In the recent trends, it is seen that most of the people want to take their lovable pets like dogs or puppies with them when they are going to travel somewhere. This is a very good approach as this way your loving dogs can get a fresh environment to breath fresh air and play. But this is very necessary to be sure that they feel comfortable during the journey time. So this is your responsibility to choose a good carrier for your dogs. So a dog carrier is one of the important items of dog owners. It may be your days out or a long vacation according to the height, length, and girth of your dogs or puppies there are different carriers available. You can choose different carriers to give comfort to your adorable pet. So you can select small, big, large, practical, comfortable carriers from a different variety. You have various options to carry your dogs. You can carry your small puppies in the front of you or at the back of you with its legs out, you can carry in a tightly zipped carrier with strap etc. You will choose the carrier according to the nature and behavior of your dogs. Below you will find a comparison table of the top dog carrier. At a glance you can compare top products provided by us so you can clearly understand the market status of the product. What are the points you need to consider to choose the carrier for your adorable dogs? To travel with your puppies in different places in the world, it may be a day out or a long tour or to a visit to the vet, the puppies’ carrier takes a useful role to give comfort to your adorable pet. This is recommended to accustom your pet before traveling with that carrier. So there are some important issues that should be considered to choose the carrier of your puppies. This is very important that your pet will feel comfortable and not feel so stressed during travel. At the same time, it is also necessary that you also feel comfortable to carry your pet during a long time of your journey. So a padding strap and adjustable strap should be there to give comfort to your shoulder. On the other hand, the size of the carrier is very important to give space to the dogs. The carrier should be spacious enough that pet can stand straight and move freely and can turn around and lie down easily in the carrier. Also, they can stand properly without touching their head or ear at the top of the carrier. Ventilation is one of the essential points to choose the carrier of the dogs. Dogs easily get dehydrated, suffocated and overheated when they feel they became trapped in the carrier. So if this condition will persist for a long time then they will fall sick. So airflow is one of the necessary requirements to carry pets or dogs in a carrier while you are traveling. The mode of the transport should in the consideration when you are going to choose the carrier of your dog. If you are going to travel in the train or car then your option will be one type but if you are going to travel in a cycle or in an airplane then in both cases your option will be different. For the cycling or hiking or racing, there are backpacks, for airlines, there is some expandable carrier and for cars or train, there is some hard dog carrier. So considering all the above needs there are various carriers available in the market which can be used for different purposes. Some are light-weight carriers like Sling, Backpack, Front back, Pouch which can be carried by you. They are also called wearable carriers. There are hard sided carriers like Expandable bag for car and airlines. No worries!!!! We are here to give you top rated puppies carriers: We are providing here some of the top rated dog or puppy carriers which helps you to find the best for your loving pet. After a very careful survey and the review of the users, we are providing you the details for your help. This is a sling type puppy carrier, which is under review got five- star ratings. This is very comfortable to carry and also spacious where your pet can feel comfortable. It is very good in fabric quality so the pet does not feel so hot in the bag and also easy to wash. According to the review, it is very easy to use and can carry up to 10lbs pets in the bag. After review, it is found that many people carried lots of other things with the pets in the bag as the storage capacity of the bag is quite large but very handy to carry. This type of bag gives close contact with your dogs. This is seen that this bag is generally used to carry pet for a short trip. It has storage capacity up to 10lbs. The fabric of this sling is machine washable and also thick enough to give softness to the puppies. It holds your pet easily and has a security lock to protect your pet. This is a very cheap dog carrier where your dog can get fresh sunlight and air directly. Buyer’s review shows that they need an adjustable strap in the bag so they can adjust the length according to their need. There is no ventilation for the dog so your pet may feel little hot in summer. The most acceptable pet carrier when you are traveling in airlines but it is used in the car also. 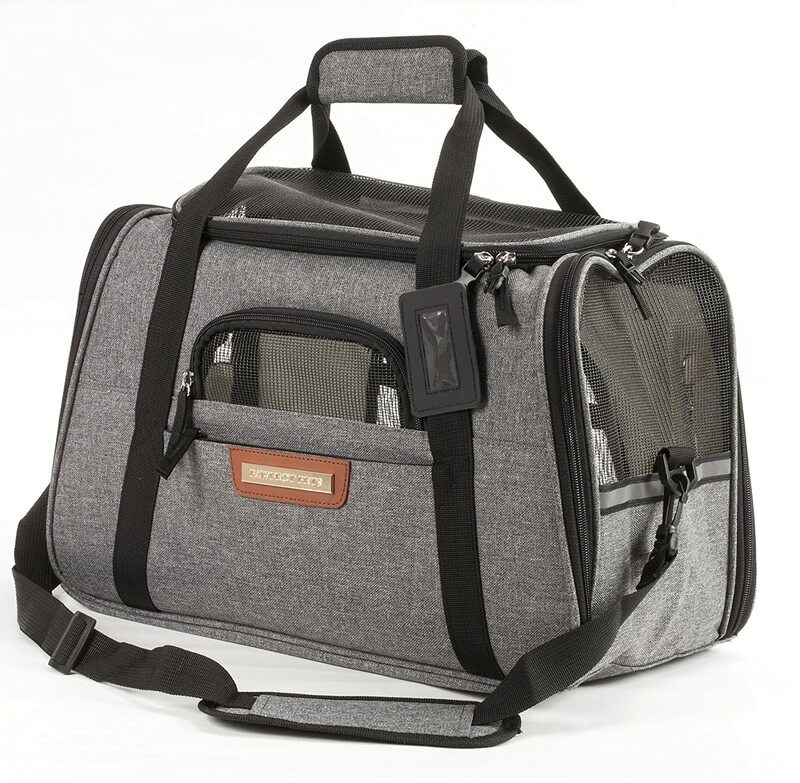 This carrier is airlines approved so your loving pet can get proper comfort during the airlines travel. 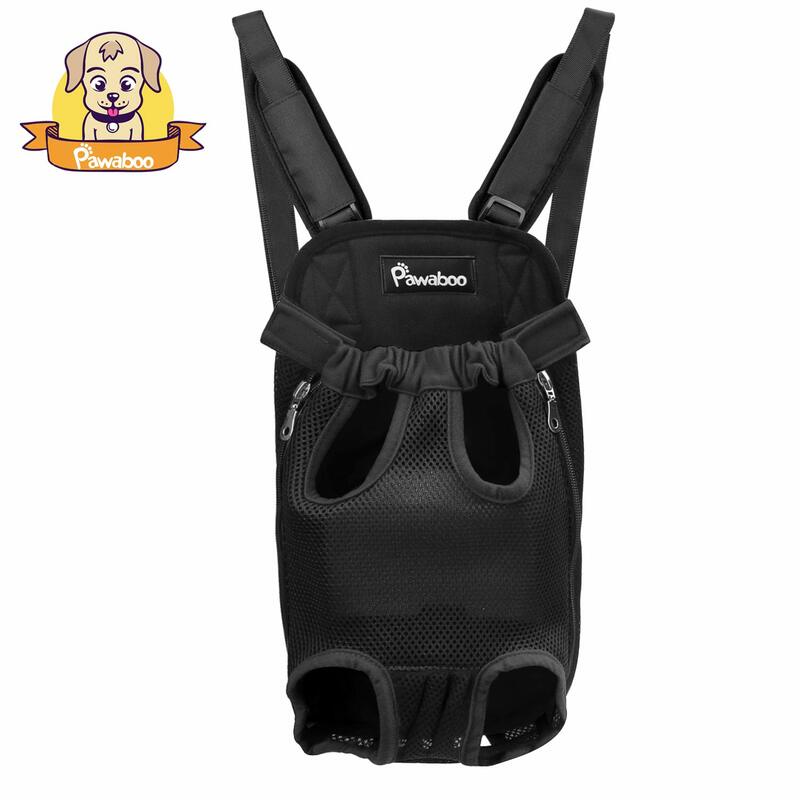 According to the review, this carrier has a proper ventilation system for the pet so your pet can get proper air circulation and keep them fresh, helps them to get proper oxygen during the journey. It has double zip on the top of the bag and dogs can be entered from both sides. Not only that this carrier is enough big so you can take a big pet in this carrier. This carrier is manageable under the seat of the airplanes. The soft padded strap of the bag helps pet owner to carry the bag easily. It has a proper ventilation system for a dog. It has double zippers on the top of the bag and has facility easy entry of both sides. It has a soft padded shoulder strap to easily carry the bag. Some of the buyer’s opinion is that this bag is not adjustable under some seats of the airplane. As the carrier size is a little bit big so you need to choose a seat under which the carrier will fit. Buyers have used this puppy carrier when they are hiking, riding or any time when they want to be free their both hands. By the using this bag they can carry their puppy either on their chest or at their back. So backpack carrier helps them to do all the work without involving their hand as well as they can carry their adorable pet with them. It is so finely designed that you can hold small puppies as well as a long dog. It has the facility of leg-out and tail-out so in the bag, the dog feels safe and comfortable when you are traveling with your lovable pet. Normally if any puppy owner is traveling in cycle or hiking or racing so they need to carry their dogs at their back. These backpacks have different pockets to hold a water bottle and other essentials for the tour. On the other hand, the front pack carrier is generally used in regular walking. It is like a child front baby carrier. This way dog lover can carry their dog or small puppies in the front pack for a small walk. There are different sizes available like small, medium, extra large, large. According to your need, you can order. The fabric quality is really good so your pet will get comfort during the travel and the side panels allow good air circulation. It has legs-out and tails-out design facility so the dog can feel comfortable. It has an adjustable strap which helps you to keep the bag either on your front or back to reduce your pressure. After lots of reviews, it is found that some of the guys informed it will be better to give more padding on the shoulder as on the bare skin it hurts. This is the type of dog carrier which pet lover can use to carry their pet for a small duration journey. It is carrying type bag and you can find three different sizes like x-small, medium and large. According to the buyer’s opinion, the fleece pet bed is one of the positive sides of this carrying bag and this beg can be machine washed. It has two carrying belt for secure carrying and also it has extra support adjustable strap. It can hold maximum 8lbs weight so this bag is normally used to carry small dogs. It has machine washable fleece pet bed. It has four-sided ventilation for your pet. It has an adjustable shoulder strap for carrying. It is a soft-sided dog carrier. According to some pet traveler, it is comparatively small in size to carry long puppies. Some of them told that there is a clasp in the carrier, probably to catch the dog that is not to escape quickly, but it is too short. They may be worried that their dog may be choked due to that clasp. 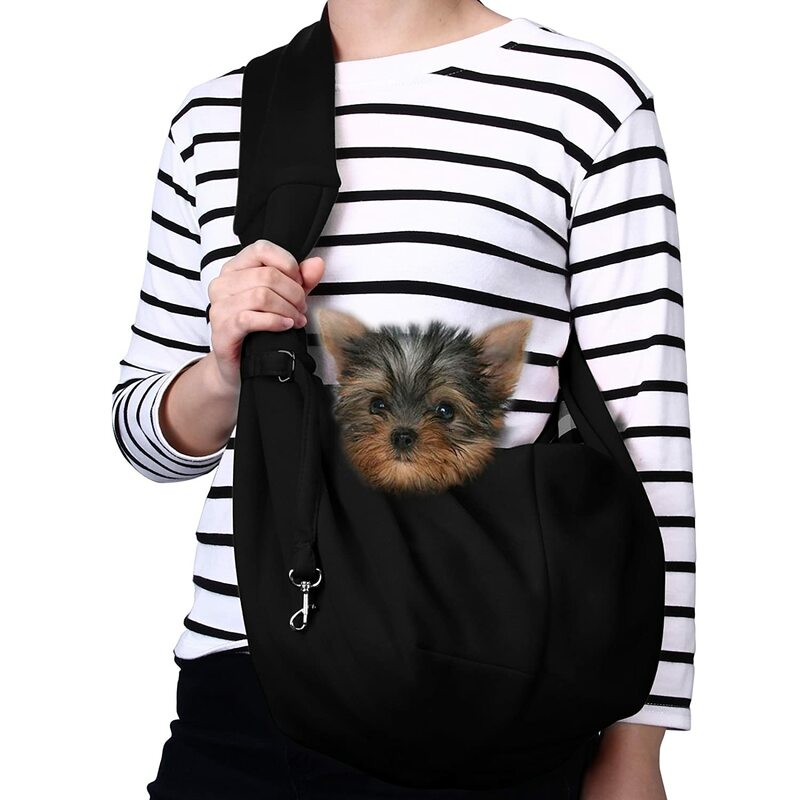 Very high-quality fashionable puppy carrier for dog lovers. 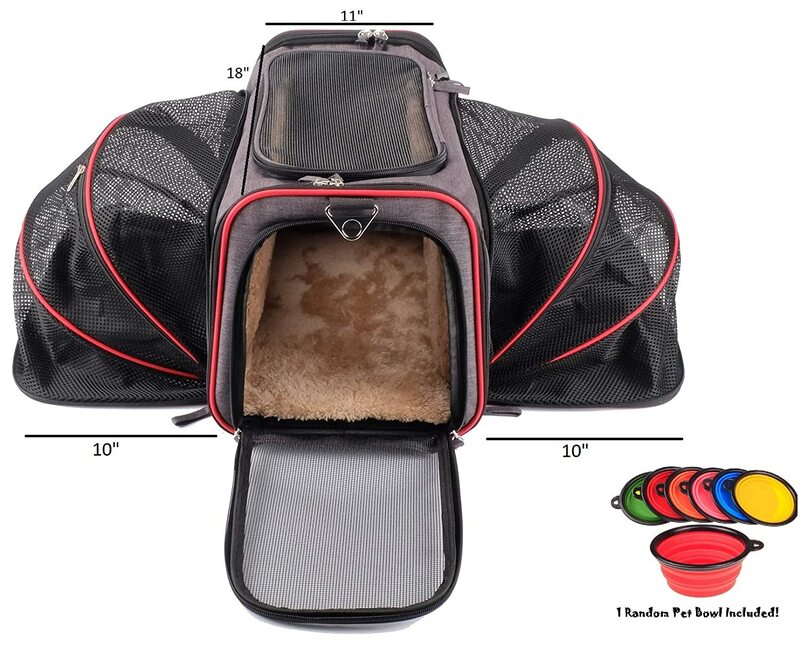 Actually, after review, it is shown that buyers very much satisfied with this bag that it has all the facilities which are required in the pet carrier but it do not look like a pet carrier. It is so trendy to look but your pet will feel very comfortable in this carrier. It is also very light to carry and you can carry up to 10lbs weighted pet. No one can see your pet from outside. It is very fashionable and high-quality pet carrier. Very easy to wash but not faded and will be dried very fast. There is a window like structure in the bag but no one can see your pet from the outside but the pet can see from the inside. Some of the buyers complain that zippers of these bags are very weak and lightweight. There are only two mesh panels for ventilation which is not exactly enough for big pets. If you are a dog lover you may want to carry your puppies where you go. So this soft pet carrier helps you to carry your small dogs with you. 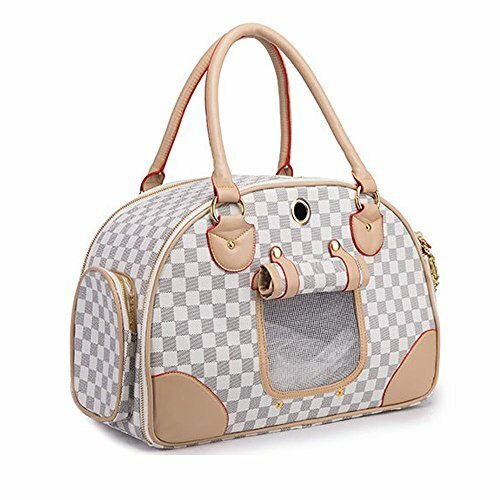 According to the buyer of these bags, it is machine washable, it has security clasp to secure your pet and prevent to jump from the bag. Some of the buyers said that the positive side of this bag is undefined and some have complained that the strap of this bag is not adjustable so it creates problems. It is in the specification that pet lover can carry 12lbs weight in this bag but some buyer’s complaints that they cannot carry 10lbs pet in this bag. It is a very soft dog carrier and you can carry your pet very easily. It measures 20″ Wide and 14″ Deep and with a 26″ long shoulder strap. Most of the buyers complain that the strap is not adjustable and this will create a problem. This carrier is especially for small dogs not above the weight of 12lbs. But some buyer complaints that they face problem to take their 10lbs pet in this bag. 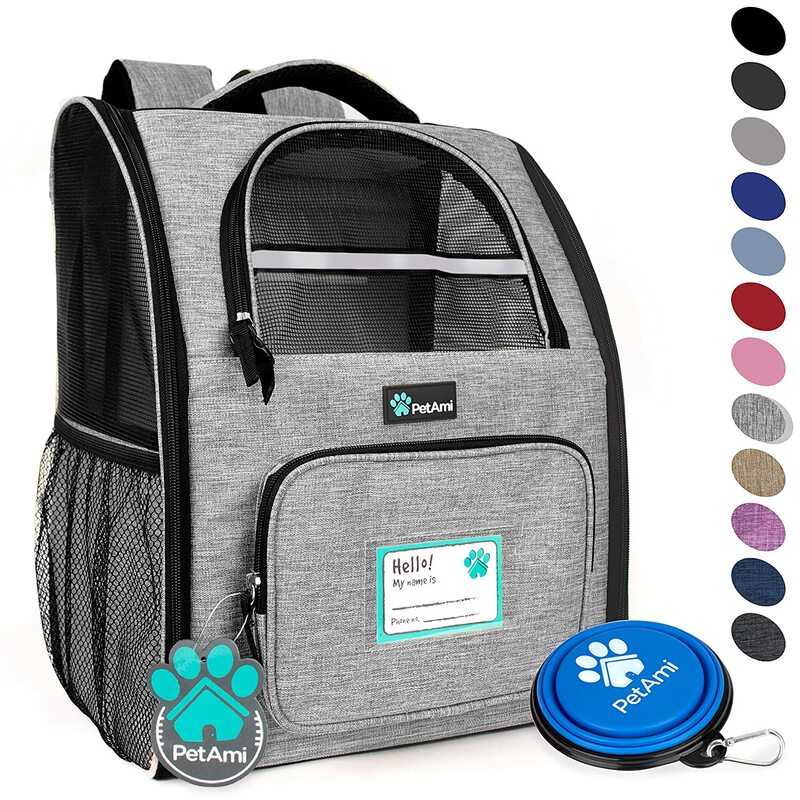 The review shows that a dog lover uses this carrier to carry small pets or small dogs when they are hiking, traveling or when they go to the vet or a simple walk to a park. Most of the buyer’s opinion is that this is a very good ventilated backpack with safety locks, zippers, and extra pockets. In this dog, carrier dog feels very comfortable as this backpack has multiple mesh windows. 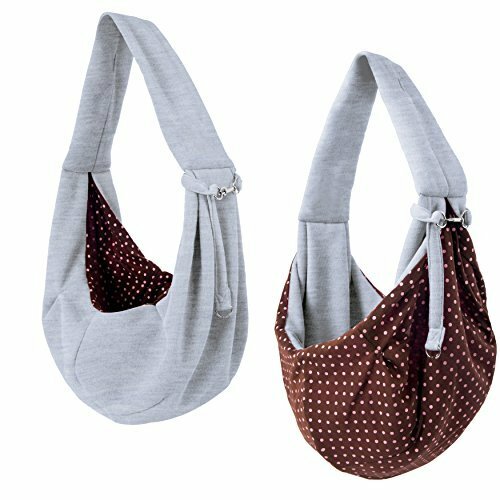 It has a shoulder strap which has extra padding which gives support to the shoulder when you are carrying the bag for a long time. It measures 12.5″ x 10.2″ x 16.3″ (Length x Width x Height). It has a two-sided easy entry so the pet can be entered easily in the crate. It has a padding bed at the bottom of the carrier. It is well ventilated to keep your dog comfortable. The most important buyer’s review is that the pack is made for a short person. So careful before buying this backpack. According to some of the dog lover, the hip strap is very bad. This dog carrier is used to carry small puppies, tiny dogs in the airlines as well as in the car. 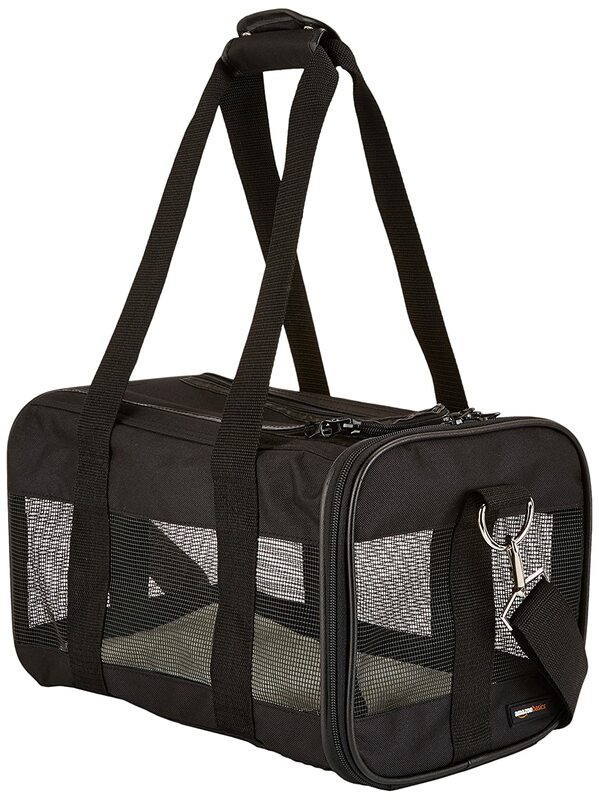 This soft-sided dog carrier is approved in most of all the airlines. According to the buyer’s review, this carrier is manageable under the seat of the airplane. It has two 2 fleece padded mats, so you do not need to worry about for spills as you can simply wash the removable mats. It measures 17.5″ * 10″ * 11″(Length *Width*Height). Two-sided open and top part also open. It has a zipper pocket. Some of the buyers complain that the quality of the product is very poor as a pet can create a hole in the carrier so be aware of that before buying the product. As this is a very small carrier, it is informed that a pet escaped from this bag during the take-off of the flight. So maybe the zippers need to improve more. Here we have provided some of the top puppy carriers reviews. Now we want to hear from you….did you buy any dog or puppy carrier? What is your feedback? From where did you buy the carrier? Please let us know. Next Why is My Dog Shaking?